An inspirational nurse-led social movement is empowering people in a Scottish community to support each other at times of crisis, end of life and when they are bereaved. Compassionate Inverclyde is helping individuals and their families in times of crisis, through a range of practical projects delivered by more than 100 volunteers – from primary school pupils to older people. Alison Bunce, a finalist in the Community category in the RCNi Nurse Awards 2018, was director of care at Ardgowan Hospice when she had the initial idea for the project after hearing Professor Allan Kellehear talk about his work taking a public health approach to palliative care. Inverclyde has a population of around 80,000. It has areas with high levels of poverty, unemployment, disability and single occupancy households. An event held in Inverclyde in 2012 saw 150 people from various walks of life sign a pledge to work towards creating a compassionate community. Then, in 2016, Ms Bunce asked Ardgowan Hospice to help fund a two-year secondment to make her vision a reality. It was approved, and the social movement was launched in 2017. ‘I wanted to create Scotland’s first compassionate community, where everyone has a role to play in supporting each other and be part of a movement to change attitudes and behaviours around death, dying and bereavement,’ she explains. Compassionate Inverclyde uses a community development approach to build social capital, recognising that caring for one another at times of crisis and loss is not a task solely for health and social services, but that care is everyone's responsibility. Ms Bunce adds that such an approach is particularly important with the increasing numbers of older people and subsequent demands on the NHS, and the general lack of available funding and resources. Ms Bunce set up the initiative through a successful community engagement programme, which included meetings with service providers, local hospital managers and community health and social care partnership leaders, as well as other stakeholders such as community groups and potential volunteers. She organised focus groups and public meetings in community centres, schools and churches. No One Dies Alone – involving a team of more than 45 volunteers who have been trained to support people and their families at end of life. There are also bereavement cafes and a community drop-in centre that seeks to support people, including volunteers, and address the problem of loneliness. 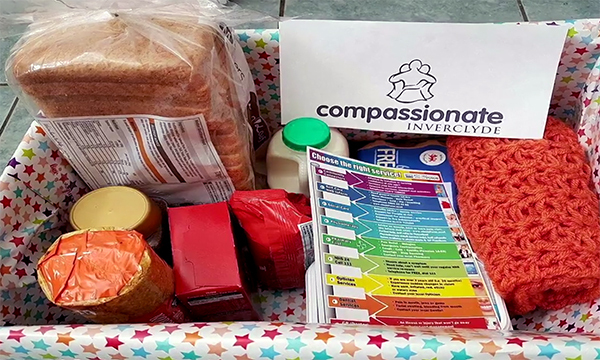 Back Home Boxes – a collection of basic essentials donated by the public to support people being discharged home from hospital – developed from the community conversations. High 5 programme – a five-week programme that covers five ways to improve personal well-being. ‘Local people were concerned that people living alone were being discharged from hospital with no means of getting to the shops and having no food in the house,’ says Ms Bunce. ‘The Back Home Box is a community act of kindness, which is now being delivered in Inverclyde Royal Hospital. The box allows the person to be able to make a light snack and hot drink when they get home. 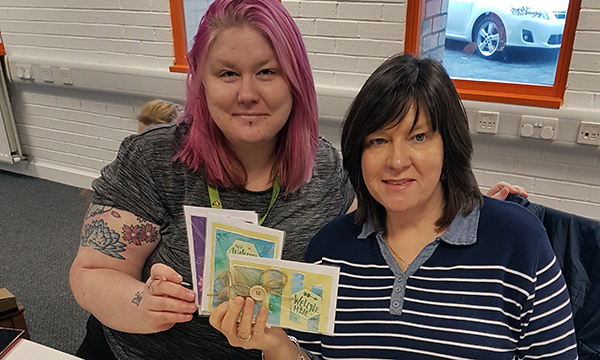 The High 5 programme has been adapted for and delivered to school pupils, college students, youth club, prisoners, community groups and a local business. Ms Bunce has the only paid role in Compassionate Inverclyde – and one of the most significant challenges she faced at the beginning was trying to realise her vision without a budget. ‘There was little funding available, so there was a reliance on community goodwill. Feedback has been overwhelmingly positive and an independent evaluation by the International Centre for Integrated Care published in November found in its first year the movement had a significant impact. Professor Anne Hendry, one of the report authors said: ‘At the time of writing, 1,300 boxes have been given out to people going home alone from hospital, influencing the direct recipients and their family members; hundreds of people are contributing through knitting, making cards and donating goods for these boxes; hundreds more people have been through the High 5 programme and have attended the bereavement cafes or the new community hub drop in centre. Professor Hendry says Compassionate Inverclyde, or any of its individual projects, is replicable anywhere. 'I have been involved with Compassionate Inverclyde from the beginning after meeting Alison Bunce on a well-being course. Ms Bunce explained what she was doing and I am now involved in helping set up the back home boxes, and I am a No One Dies Alone volunteer. 'The project I enjoy most is working with schools on kindness projects. I am working with a group of 13 and 14 years olds who want to help homeless people. We are looking at ways of raising funds and awareness. The teenagers help at the soup kitchens preparing lunch on Fridays and are collecting and distributing coats and jackets to those in need. 'Compassionate Inverclyde gives the community a chance to express their kindness. People can give as little or as much time as they can. There are lots of different aspects to be involved in.